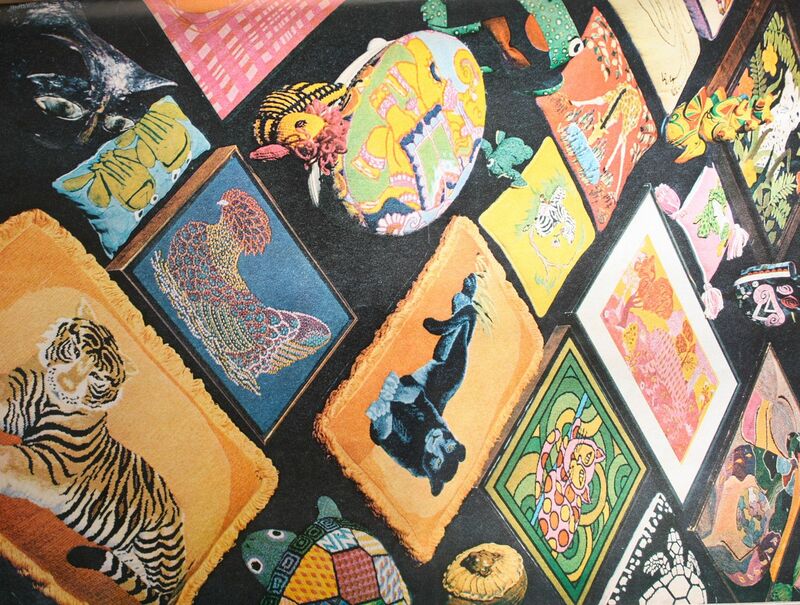 I've had fun going through some early 70's House Beautiful magazines. It makes me smile about the fact that so many styles tend to recycle and make a come back both in fashion and home decor. How are you liking the comeback of the wide-legged slacks, billowy tops and drapey cuts? The below images are from a photo shoot for Lucky Magazine. 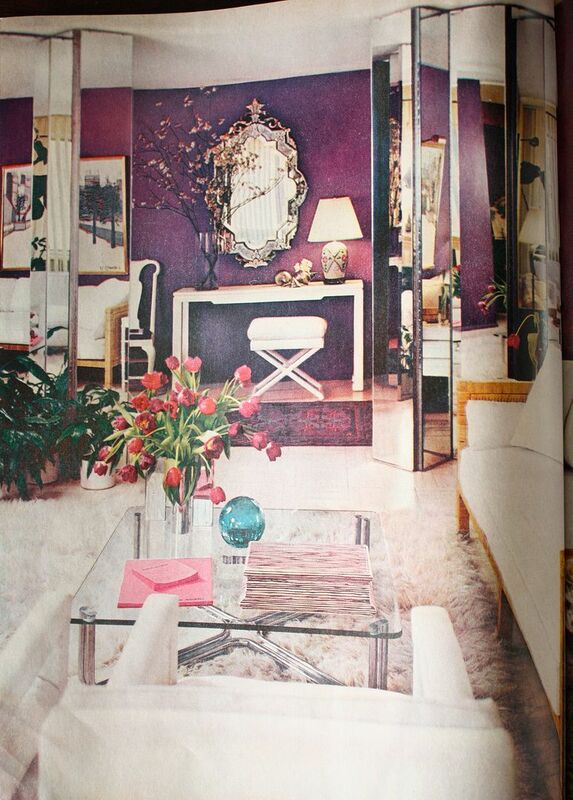 I am dying over the 70's interiors... I mean, those homes look JUST like what I've been seeing all over the blogosphere! You're right, the style is totally recycled... amazing! Thank you so much for sharing this fun find! 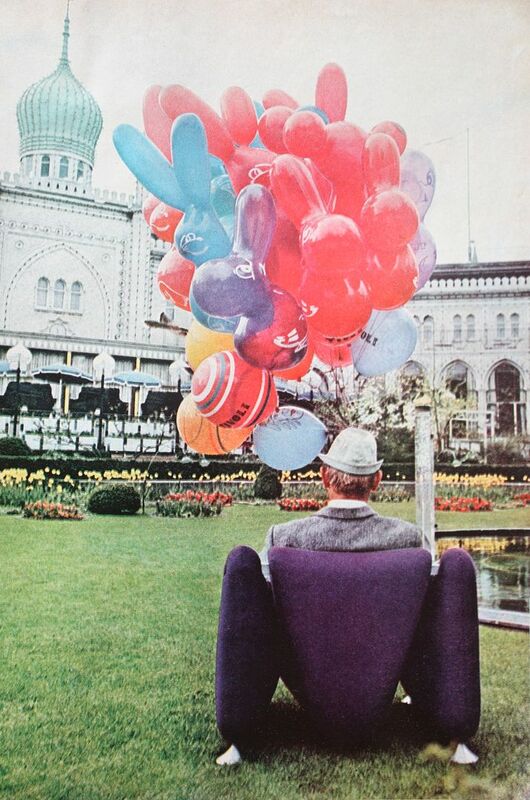 I find that I am constantly referring to how the 70s are back, and boy do these images confirm! 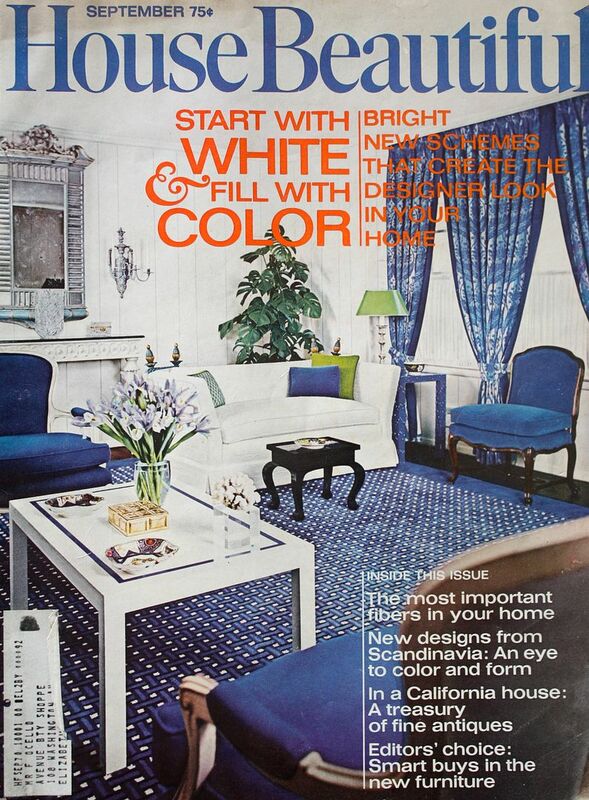 That cover could absolutely be a current cover (in fact, there have been a couple of mags doing Blue and White covers), and that image with the white couch and all the "global" pillows is dead on. Thanks for sharing! I am so happy the 70's are back, with our own modern twist to it. 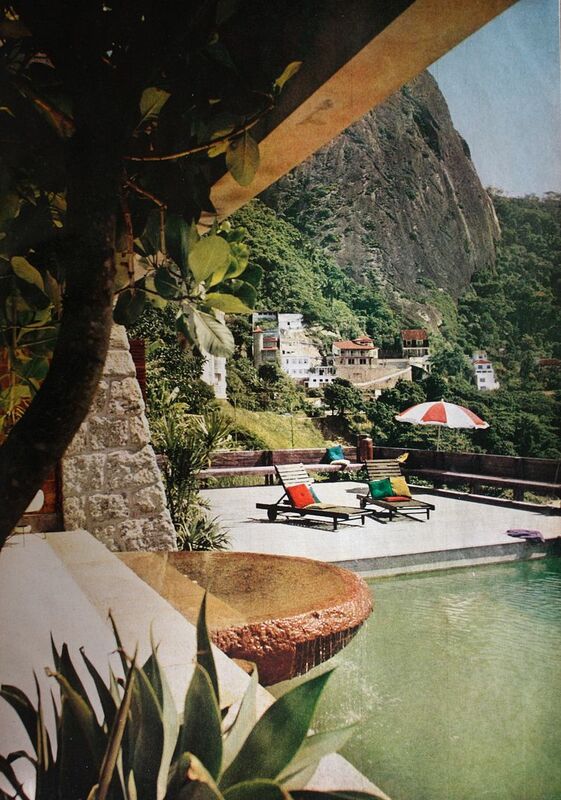 Where did you get the 70's House Beautiful's?? And I loved that photo shoot for Lucky, I've been on the look out at my local thrift to see if I can find any gems. Love this post! great comeback! im actually going to wear my wide jeans tomorrow! 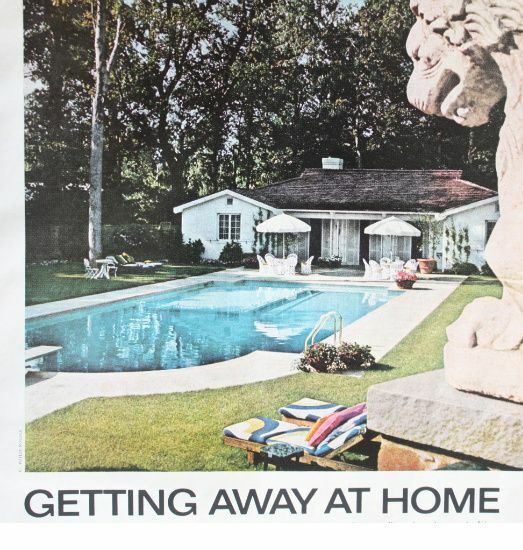 Wait - maybe I should have just left my 1975 house *exactly* how it was! I actually really like where we are in fashion right now. I feel like things are more practical and versatile than they have been for a long time. Longer skirts (fully knee-length and maxi)! Cuts of jeans beside skinny (although those are still good too)! Cuts and structure that flatter those of us who are not shaped like J. Crew models! Love that rug in image 3! thanks for sharing! do tell where you found those "vintage" house beautifuls? so fun to compare to our design style! anywho i love any sort of fashion that covers up my gut--so bring on the billowy. Did you get another table?? wanna hear the details. Whoa, Nellie! Where is the faux wood paneling? I did not see any of these houses when I was toddling about in the 70s. I must have been in the wrong 'hood. I love it! When something is good, it is good 30+ years later. 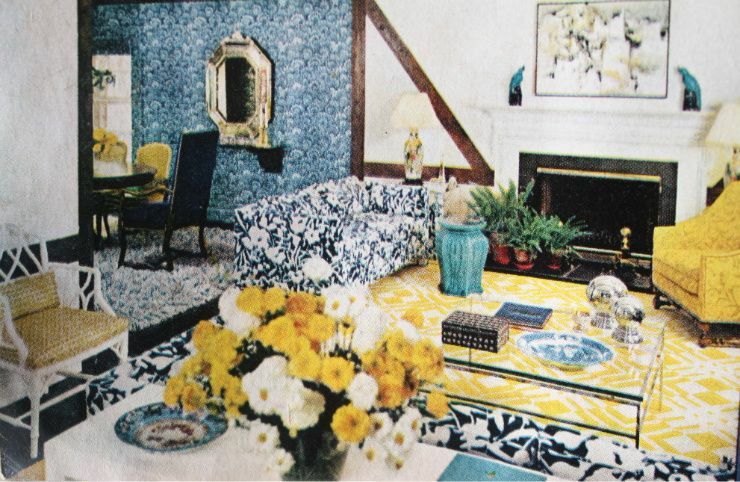 I used to sit in the art/architecture library at my university and flip through vintage home mags. Just like blogging, before I knew it, hours had passed by. What good visual stimulation. Yes, hoping to score some wide leg jeans that are LONG soon! No highwaters need apply. I bet you are rocking that look outta the park. Those 70s HB photos are amazing! 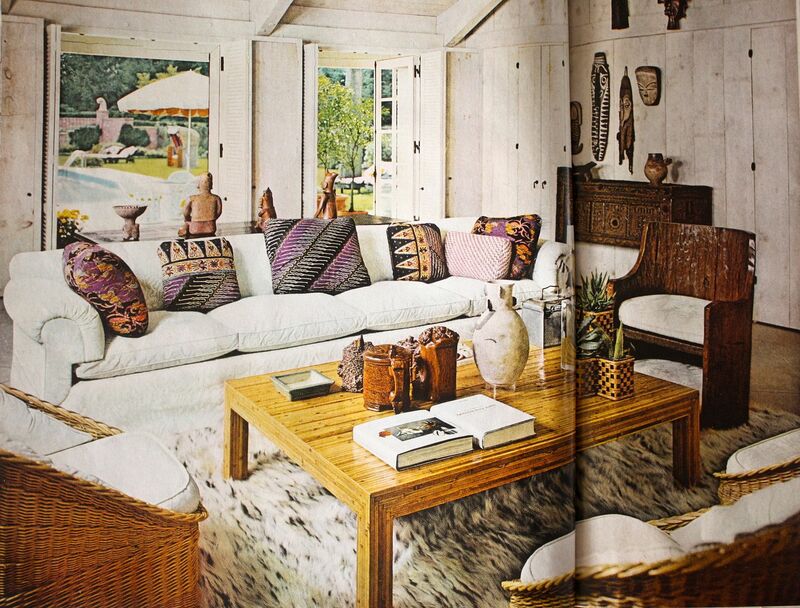 That last interiors photo is just fabulous. And I'd kill for those mirrored folding screens. Actually everything in the photo! geez louise this post is legit. I'm stunned speechless. Those vintage HB photos are amazing. Had you not posted a circa 1971, I would have thought they were current without blinking an eye! I love this!! Soo awesome! YES! Old magazines are treasure troves for ideas and inspiration; I always look for boxes of old shelter mags at garage sales & thrift shops. Great post. Makes me want to wear Halston and sip on really '70s-era cocktail, like a Tequila Sunrise! LOVE 70s everything - clothes, music, interiors. Love, love, love! Wow, I'm amazed at how timeless some of those spaces look. And yes, I'm dying to get myself a pair of high wasted, wide leg trousers. They look great on models.... just a question if I can rock them too. Wow. Everything does come back. However, I refuse to do the '80s again. Beth I got the House Beautiful mags on Ebay. That magazine could totally have been published today! Looks like history is repeating once again and I LOVE that style!